Catwoman™ has robbed the jewelry store and is about to get away on her powerful Catcycle. Rush to the scene of the crime with Batgirl™ and Robin™ to intercept her. Watch out for Catwoman’s lashing whip and the falling lamppost she knocks over with her bike. 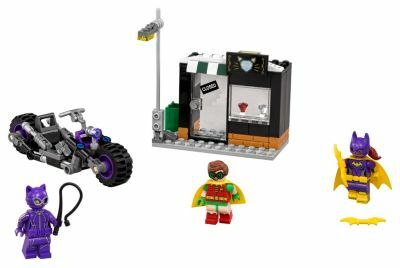 Attack with Batgirl's Batarangs and leap off the roof of the store onto the Catcycle with Robin. Capture this Super-Villain and return the jewels! Price is 33% below the initial Lego retail price, a € 10.04 discount! This comes down to 14.35 cent per brick. Lego 70902 Batman Movie Catwo. The Catwoman™ Catcycle Chase (70902) Lego set is no longer directly available from the sites below. However, 3rd party partners of these sites might still have the set available. Alternate description Stop Catwoman™ escaping with the diamonds!